The key to setting up your potted garden is about starting with the right size and shape choices for your flowerpots and planters so your plants can look and thrive. Keep your plants healthy and transform your outdoor area into a living place by starting with the proper size and shape when choosing plant containers. Large plants in small containers dry out quickly, and small plants in large pots do not create the right impression. In addition, regulating moisture in the soil can also be difficult. If you’re new to gardening or looking for a change, these tips will help you choose the right flower pots and planters for your outdoor area. 1 Why is size so important? 2 Which sizes for flower pots and planters are suitable for outdoor use? Why is size so important? A plant must be potted in a container that has enough room to grow but is not too big for the plant itself. If you place the plant in a pottoo small for it, its growth is stunted. In addition, fibrous root structures form, which are tied pot and can bring the soil to dry quickly. Conversely, a small plant potted in an oversized container may be unbalanced by the unbalanced moisture content in the soil. If plant roots can not reach the bottom of the pot and the drainage holes are completely clogged, excess moisture collects at the bottom of the container, forming a mass of moist soil mass. This can either result in root rots, extra-heavy planters, or an unpleasant odor of wet soil. Which sizes for flower pots and planters are suitable for outdoor use? How much soil a plant needs and how big a container must be depends on the type of plant. It is also important how deep the roots grow. For each planter, store the amount of soil in proportion to the type of plant and the size to compensate for soil moisture. For ornamental plants, such as small succulents , you need a flat bottom that is less than 15 cm deep. For year-round plants, a depth of the soil of about 30 cm is sufficient. The soil for perennials should be between 30 and 45 cm deep. Bushes need a bit more ground, which must be between 45 and 60 cm. Small trees need even deeper soil, which is between 60 to 90 cm. For example, for these dwarf blueberries, you can use medium-sized flower pots and planters in which they will certainly thrive, as these, as the name implies, always remain small. For most edible crops grown as crops, it is better to have more space in the pot. Herbs that are planted in the house can grow in soil that is 15 cm deep. Outside, you can pot them with a depth of the soil of about 30 cm. Flatroots such as salads, strawberries or radishes can be planted in 15 to 30 cm deep soil. Medium-sized edible plants, including peppers, eggplants, pumpkins, melons and corn, require a depth of at least 30 to 45 cm. For large-sized edible plants such as tomatoes, potatoes and berry bushes, give at least 45 cm or better still 60 cm soil. Citrus fruits and other fruit trees need a soil mass that is 60 to 90 cm deep. An important factor for the proper growth of a plant is not only the size of the container, but also its shape. The most widely used and practical flower pots and planters for outdoor use are round, square or rectangular. Some of them are also equipped with an irrigation system. Medium to large round, square and rectangular containers with deep soil reservoirs from 30 to 90 cm, depending on the type of plant, are good and suitable varieties for flowering perennials, shrubs and small trees. Use larger pots to plant combinations of several species so each plant has room to grow. Flat and low flower pots and planters with less than 15 cm deep soil are ideal for growing small succulents, chickweed or houseleek plants. Planting frames can bring low flower pots and planters a little closer to eye level. Flat containers are also well suited as showpieces for outdoor dining tables. Vase-shaped pots that bulge at the top are suitable options for mixed combinations of annuals, flowering perennials and an evergreen shrub or small tree. A wide opening provides plenty of space to put together a combination of plants. Select the depth of the container based on the plant species you want to include. Many variants are available on the market today. A practical option would be the flower pots and planters made of rattan. Classic-style urns, which are wide at the bottom and have a narrow neck and a wide opening at the top, are good flower pots and planters for annuals and easy-to-remove perennials. Keep in mind that if the plants are deeply ingrained they can be difficult to remove once a root ball forms under the urn’s neck. If you are thinking about something ingrained like a shrub, a vine, or a small tree, plan to leave it there for its entire life. Therefore choose the right size of the urn in time for planting. 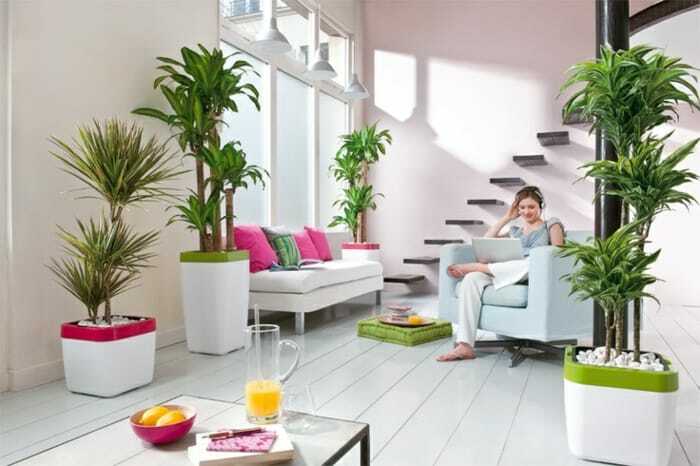 Large, upright and thin flower pots and planters can help increase small plants and give them more visual impact. Be careful when pairing a shallow-rooting plant, such as a succulent plant with a large container filled with more than 60 cm of soil. They can flood you so that subsequently also wet soil mass collects at the lower part of the pot, under the plant roots. This potted combination of plants hits the point, so that the shape and the ground agree with each other. The vertically designed flower pots and planters help the plants to grow taller, with the bottom of the container not too deep and thus no risk of getting soaked. Since the size and shape of a container affects how well a plant grows, it is a good idea to select plants and vessels at the same time. Otherwise, you must combine the desired planting with existing pots that you want to replenish. When choosing a container based on a plant, do not rely on the initial size of the plant when estimating the size of the pot to be used. Instead, first look at the mature size of the plant (often found on the back of the label). Also note in which category it falls – succulent, annual, perennial, shrub or tree. Also, be sure to choose flowerpots and planters that have enough space for the plant and a depth of soil that has plenty of root space. As already mentioned, it is important to give more space to the plants grown in containers. (Refer to the list of estimated depth of soil for edible plant species described above). Cultivating crops such as tomatoes, peppers, zucchini and aubergines in a crowded container, they compete for nutrients and sunlight, which can lead to lower yields. In general, it is best to plug each medium or large edible plant in its own container – possibly placing herbs or pollinated plants such as marigolds around the base if there is plenty of room. Salad and smaller plants such as radishes and strawberries can be planted several per container. Container-grown foods absorb many soil nutrients to grow quickly and produce a good crop. With a balanced organic fertilizer you can fertilize them according to the package instructions. Plants are not happy if they are left behind in a container from which they have outgrown. Here are three signs that your plants need to be repotted. Plants look overgrown and are no longer proportional to the pot. Water runs quickly out of the pot, indicating that roots and soil, which no longer absorb water, occupy most of the space. Plants show signs of stress, such as yellowed leaves, death or stunted growth. Select a container that is at least a few inches larger than the original container (width and depth). Remove the plants from the old container by digging 10 cm or lower to loosen the roots. Then gently pull the plant with a planter bucket when needed for leverage. Keep the plant as much as possible from the root ball. Refill the new container with fresh potting soil for immediate transplantation. Pour well to allow the potting soil to soak. Alternatively, you can transplant in garden beds and not in a new container. One-year plants and perennials in the warmer months may look like they have grown out of their containers towards the end of the season, but that is completely natural and does not necessarily mean that they need to be repotted. Flowers that turn into seeds and yellow are only part of the life cycle of the plants. Pull out the annual flowers at the end of the season. Cut flowering perennials after a frost. If the plants appear rooted after one or two seasons, divide up the remaining perennials and plant them in other flower pots and planters, or in garden beds.